Justin Thomas walks to the 13th green during a practice round for the PGA Championship at Bellerive Country Club. ST. LOUIS — A walk from the driving range to the 10th tee at Bellerive took longer than usual for Justin Thomas. One marshal wanted an autograph. Another wanted a selfie. He made it under the tunnel to find two more people stopping him for pictures. Thomas eventually made it up the stairs, onto the putting green and up a slight hill to the tee box with thousands of fans crammed on both sides and every seat in the grandstands occupied. That’s where some degree of normalcy returned. He was playing with Tiger Woods. This was only Wednesday afternoon, and it’s certain to be far more boisterous for the start of the 100th PGA Championship when Thomas tries to become only the second player in 60 years of stroke play to successfully defend his title. “Being the deepest field in golf and a great golf course and a lot of players trying to knock off that major here at the end of the year that haven’t gotten one yet this year … any tournament is a tough one to win, but this one especially is,” Thomas said. Thomas is coming off his first World Golf Championship title last week at Firestone and is among the favorites at Bellerive, which was starting to dry out from downpours earlier in the week. Thomas hasn’t heard that in a while. He won the PGA Championship at Quail Hollow (Spieth was among those who hung around to share in the moment), added a FedEx Cup playoff event (Spieth was the runner-up), captured the FedEx Cup and the $10 million bonus and swept all the big awards, just like Spieth had done two years earlier. 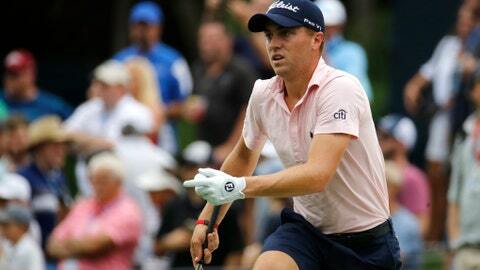 Dating to last year at the PGA, Thomas has won five times. Spieth has gone more than a year without winning. “My last couple of wins, or maybe last year probably is when … I started to get out of that shadow,” Thomas said. This is a deep friendship that transcends any rivalry, and Thomas was never overly bothered by the mention of being Spieth’s close friend. He understood that Spieth, who turned pro a year earlier and effectively had a two-year start on him, has more majors, has won more tournaments, reached No. 1 first and stayed there longer. There remains another shadow that was even stronger at Bellerive, and Thomas fully expects that. Playing with Woods — along with Brooks Koepka, J.B. Holmes and what felt like half the state of Missouri — made it a true practice round. Thomas plays the opening two days with Woods and Rory McIlroy. Woods might be bigger now than when he was winning, perhaps because fans had every right to wonder if they would ever see him again, or see him when he was capable of posting low scores. Coming off a fourth back surgery, Woods has made it through eight months without any health issues — though he did have an ice bath after a long week in the heat at Firestone — and has shown flashes. The most recent was at the British Open, when he had the lead for two holes in the final round until fading to a tie for sixth. All that did was ratchet up the hysteria that perhaps another major is in the cards. This is his first PGA Championship since 2015, which was the first one Thomas played. The players with Woods on Wednesday — and for the next two days — were telling. Koepka has won the last two U.S. Opens. Thomas is the PGA champion and No. 2 player in the world. McIlroy began his run of four majors in a four-year stretch about the time Woods began dealing with injuries. And there are plenty more like them, from Dustin Johnson growing impatient about not winning a major in two years to Spieth getting another crack at the career Grand Slam, to Rickie Fowler trying to shed the label as among the best without a major. For Thomas, a place in the record book with Woods. For Spieth, a place among the most elite group in golf. For Woods, the defining moment of a comeback.